How do I eat soup correctly? Is it ever okay to butter the entire dinner roll before eating it? Do I hold my white wine glass differently than a red wine glass? Does it really matter? Each table setting page offers etiquette tips for both host and guest, created to ease you through uncomfortable dining moments. 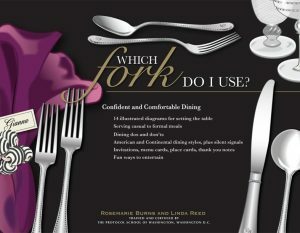 The “Always and Never” section succinctly answers 26 little questions you may have about dining etiquette-most importantly, the big one: Which Fork Do I Use? Remove non-edible objects, such as fish bones, olive pits, gristle, or fat, with your fingers or flatware and place them on the edge of your plate. My friend likes to text on her cell phone at dinner. She thinks it’s all right because she does it in her lap and not on the table. Is that okay? I’ve been to a lot of dinner parties and they all seem the same. Any ideas on adding excitement to mine? Consider theme parties as a way to add excitement to a dinner party, like a sushi dinner, fondue, set up a dessert buffet or perhaps serve a cheese course in place of dessert. The book describes how to pull them off with flair and great fun! The book is filled with suggestions on being a great guest and host. For example, if you bring your host flowers, bring them in a vase so the host doesn’t have to scurry around to find one or send them in advance, or as a thank you gift after the party. And NO, it is not okay to text at the table during dinner. Have you ever been invited to a special event, sat down at an elaborately decorated table and been mystified by the three forks, three knives, and been clueless as to which napkin (not to mention, water glass or bread plate) is yours? Ease your worries. Which Fork Do I Use? is an information packed and easy-to-follow guide to all things about dining! Let The Dinner Party Begin! What is a good place setting for my husband’s promotion party? Can you suggest a great menu for a dinner party or a weekend brunch? This book contains sample place settings for a variety of occasions. Simply place Which Fork Do I Use? on your table and follow the guidelines for setting the table, serving, guest seating, and all that comes with making your event one to remember. Each place setting offers a sample menu, how to prepare the table, and dining tips. Both casual and formal dinners call for a welcoming toast that is made by the host. At casual dinners it may be a simple phrase meaning “enjoy your meal” (such as “bon appétit”) and is offered to all guests at the beginning of the meal. Before the dinner concludes, someone should make a toast thanking the host for the dinner party. Avoid embarrassment! Prepare yourself for potential party predicaments and etiquette errors at casual or formal dining events. Which Fork Do I Use? is a great resource and contains page after page of dining tips that will help improve your confidence level. Learn about host gifts, accepting invitations, graceful recoveries from awkward situations, and when to toast the host. Fun to read “Don’t be that guest” advice underscores what you may already know (or, gasp, what you don’t). When unsure what to do once you sit down at the table, follow the lead of the host. Don’t dive in and start to serve yourself or, worse yet, begin to eat. Throw a party like a pro! You have invited your peers to dinner. You want it to be nice, friendly and enjoyable, but unsure how to pull off a dinner party? Now what? Planning is the key to a successful dinner party. This book takes you through the pre-party basics, setting the table, greeting your guests, what to do after the guests are seated, styles of serving the meal, and what to do at the end of the meal. Hosts will find the check-off list, timelines, setting up a home bar, wine pouring finesse, and beautiful serveware illustrations especially helpful. When planning your menu, not everything has to be over-the-top. Select one menu item to be memorable.